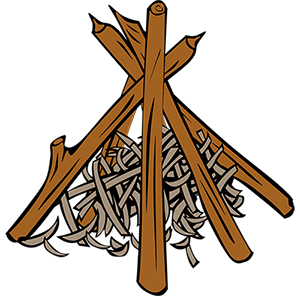 One of the things that campers like to do is build a campfire. 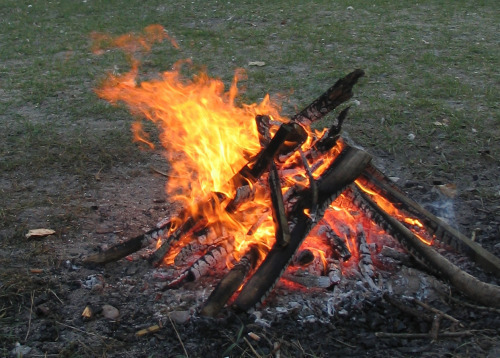 We will give you some tips so that you can build a beautiful campfire during your holiday. It’s a bad idea to build the campfire right beside your motorhome or lodge. As a rule of thumb, try to be about five meters away from your base, and other potentially flammable objects. The best surface is one that’s flat, and in which you can dig a hole, or control the fire easily. Also, make sure you have permission! Check with the owners or park rules. Once you have the rest prepared, you need the materials. Firstly, you need smaller branches of 50-70cm, to form the base of the fir. Next, some kindling. This is easily flammable material such as twigs and leaves, or straw. Lastly, some larger logs to sustain the fire once it has got going. Lay down the smaller twigs and leaves in the middle of the circle. After this, build a tent around it using the 50cm sticks. Leave an opening to stick small twigs into the center. Leave enough space between the wood to allow oxygen. Once the “tent” is up, you can light it with a match. Allow it to burn, adding slightly bigger pieces to produce embers. Eventually put the larger pieces on, still giving it a chance to breather. Now you’re ready to grill sausages and roast marshmallows! Make sure that the fire is completely out. This means now more embers or flickers. Use water and sand to ensure it’s dead and covered. Sweep the ashes and remnants into a trashbag, and throw it away.